THE SACRIFICE OF THE MASS -- Memorial of the Paschal Mystery and Offering. Man's basic desire to make sacrifice to God was fulfilled in the perfect offering made by Jesus when he surrendered voluntarily his life on the cross. His selfless sacrifice was made to his Father on our behalf as we sought forgiveness for our disobedient and sinful lives. Jesus said, the night before he died, 'Do this in Memory of Me'. Through the ordained priest, at Mass, we make this same offering and for the same reasons. "Father, we celebrate the memory of Christ, your Son. 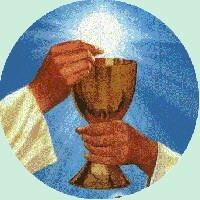 the sacrifice of Abraham, our father in faith, and the bread and wine offered by your priest Melchisedech. to your altar in heaven. let us be filled with every grace and blessing." " I in them, and thou in me: that they may be made perfect in one" John 17 : 23. 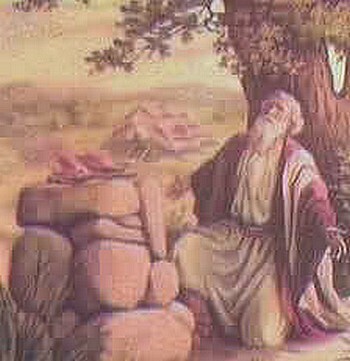 Read about Abel's offering to God in the book of Genesis, chapter 4 verses 4ff. Genesis Chapter 14, verse 18 relates how the king of Salem "and a priest of the Most High God, brought bread and wine to Abram".